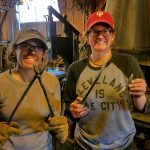 Blacksmithing, is truly an artform, its filled with challenge, beauty, and constant learning. Thats what makes it so easy to love, andif you have the drive to learn this ancient art that his been with us for thousands of years, I think Steve is a pretty darn good teacher to set you on the path, he will be there to digress whatever information you need, you simply have to ask, and he is always willing to show you knew things, and old tricks, that can make an average project, an extraordinary one. The cowboy forge is a great place to learn smithing, and Steve is a good man, and a great teacher who will deffinately show you the path forward in this art.